The Rohrer College of Business is host to four Centers of Excellence. These centers strive to support the mission of the college, give our students real-world experience and prepare them for a successful career. The Roher College of Business (RCB) has established several learning opportunities for students with professional organizations which benefit student growth and organizational performance. Students are offered a variety of real-world experiences including tax preparation, financial market research, enterprise computing software, and much more. 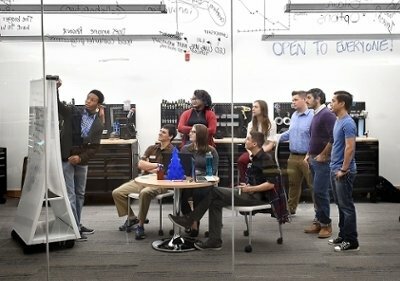 The Rowan Center for Innovation and Entrepreneurship (RCIE) supports student entrepreneurs from all Rowan University colleges and campuses. The mission of the Rohrer College of Business Center for Responsible Leadership is to support the implementation of the Six Principles of PRME, advancing the values of responsibility, sustainability, and ethics among our students, faculty and community partners.